We’ve seen plenty of revivals of Roland classics, but Cyclone Analogic’s recreations are not the usual trio. When you think about it, Roland must be the most generous hi-tech music company ever to go into business. For decades they point-blank refused to rebuild, reissue or remake their analogue classics despite an obvious and unwavering appetite for them. This left the way open for countless others to step up to the mark, warm some solder and attempt to fill the gap. 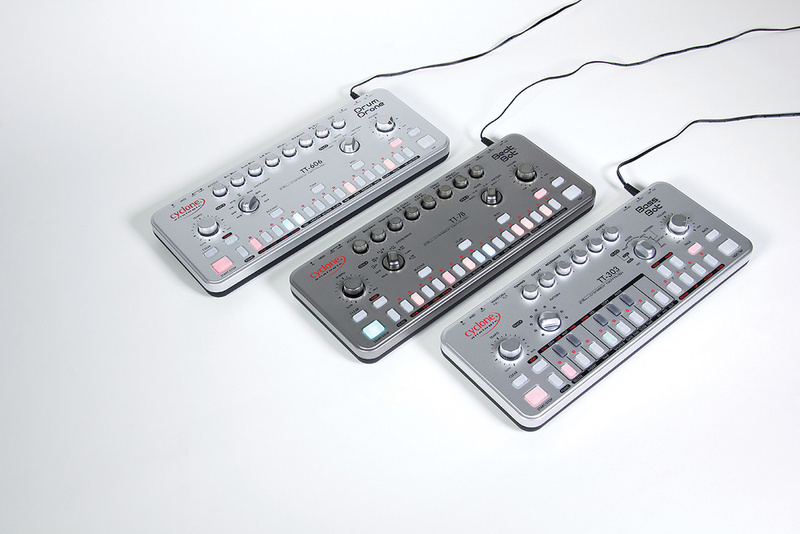 The TT-606 Drum Drone, TT-78 Beat Bot and TT-303 Bass Bot from Cyclone Analogic are three current examples of gap-filling, and as you can probably tell from their names, they aren’t the models most often copied (well, two of them aren’t), making it far more interesting for yours truly. While these analogue-voiced machines each contain different circuitry, they have much in common. Presumably, Roland’s altruism was stretched past breaking point because the earlier ‘dead ringer’ appearance of the TT-303 has given way to a new form with rounded edges and rubber, multi-colour buttons. This look has been adopted by the rest, which are a neat and very portable collection at 310 x 130 x 35 mm, weighing in at just 783g. Where possible, a common layout has been adopted, but thanks to RGB buttons capable of a dozen different hues, you can customise each unit to its own default colour. If I had my way, all buttons would be like this! Incidentally, the drum machines can manage a 13th colour (a slightly bluer turquoise) simply because more buttons equals more choices. Although light, they don’t feel insubstantial. The silver plastic (or faintly coppery plastic in the case of the TT-78) is shiny rather than silk or matte. All the knobs feel suited to the fondling they’ll inevitably receive. I have just one minor reservation concerning the externals: the dark red text doesn’t show up well against the black background; thankfully it isn’t widely used. The smoothly rounded TTs (no sniggering at the back there!) require an external 9V adaptor, which rules out the battery-powered jamming of the venerable TB-303 and TR-606. To ward off dust and protect the knobs from the ravages of the world, every model ships with a plastic protective cover that fits snugly over the top. In addition a neat canvas bag is included, complete with a compartment for the adaptor. And if you require still more evidence that care and thought have been properly applied, a full colour manual laid out in easy lessons is present too, guiding you through every nook and cranny. All models are properly MIDI-enabled and I’d be surprised if anyone was too worried about the lack of DIN Sync. A rear-mounted switch determines whether the MIDI out functions normally (ie. sends note and clock information) or as a thru. Confusingly though, on the TT-303 alone, the switch has a second label, that of waveform selection. Therefore, and contrary to appearances, MIDI thru on that unit is enabled by entering a menu instead. None of the menus are deep or complicated: in most cases the functions are printed under the step keys and accessed by roping in ‘Func’. A particularly tiny switch is used to power on and, being close to the 9V adaptor input, it’s rather fiddly to access. All models have full-sized mono outputs and headphone connections, but the drum boxes have seven individual outputs too, on mini-jacks. Naturally, the respective instruments are subtracted from the main mix when any individual output is used. Unsurprisingly, the mini-jack sockets have a different purpose on the TT-303: they provide CV/Gate outputs, an accent output, analogue clock and Run/Stop signals, plus the straight VCO output and an input to the filter — pretty comprehensive! For no reason other than my own nostalgia, let’s begin with the TT-78, a modern take on the legendary CR-78. If you recall, the CR-78 was a square box with wood-effect finish and sufficient preset rhythms to please organists (and onanists) everywhere. Its remit was broader than you might think thanks to programmability (four memory locations), a generous selection of voices, accent, fills, and a quirky pattern fade in/out feature. I never did get hold of the WS-1 programmer for mine, but sampled it before we eventually parted. I realise that a brand-new CR-78 would have provided the fairest comparison but, although individual voice differences were evident, the Beat Bot’s credentials were clear from the start. Listening through the voices, the bass drum has considerably more presence than mine ever had, and while the snare is similar, it is much more snappy. I quickly realised that the TT-78 goes a long way beyond the original box and not only because of the level controls and individual outputs. I should point out at this stage that with 13 distinct instruments on offer, some sharing of knobs and outputs is necessary, but this never feels like much of a compromise. Further exceeding expectations, each voice has a unique tone control and an LFO for good measure. So not only does the innocent-looking Beat Bot improve on the original machine, it offers more personalisation than classic drum machines of yore. Bearing this in mind, it’s just as well you can store user kits — 32 of them — for instant recall. Typically, the tone control adjusts the tuning of the selected voice, but where some voices are concerned (eg. the bass drum, maracas and tambourine) it’s the decay that is variable. For the snare, you can control the snap, or noise content, but never enough to rob it of the short and distinctive quality that screams ‘CR-78’. For the cymbal and hi-hat, the tone control acts as a balance for the ‘metal beat’, a sonic element that’s always present, although you can’t address or program it separately. A combination of the tone knob and Func key is sometimes required, for example to tune the cowbell, guiro and congas. The tuning range of most voices tended to be a little wider than that of similar drum machines, eg. the claves can drop way lower than usual (no bad thing). It was while examining each voice in isolation that I noticed some have a low-level noise content. In particular, adjusting the tone of the clave/cowbell or conga/bongo applied a subtle but audible filtering. Generally though, the noise levels were not an issue. From within the ‘Inst’ menu, you’ll discover alternate versions of some instruments. There is a choice of four different timbres of hi-hat and cymbal, which actually translates to four different tunings of the metallic component. With such a wealth of voices to choose from, some are forced to share the selector dial, eg. congas and bongos, tambourine and guiro. Fortunately there’s a straightforward method of programming both into any pattern and spotting which is which afterwards, thanks to intelligent use of colour. Already I was starting to see these familiar sounds in a new light, and there’s no denying that light is an integral part of the TT-78’s appeal. Any or all of the 64 available patterns can be coloured to taste and by selecting a pattern range, you can splash colour in a single vivid operation. Not only can patterns be coloured to taste, they can be any length between one and 64 steps — unless you’re using triplets, in which case the limit is 48 steps. There are options for extending patterns and automatically filling the added steps if required and, in multi-bar patterns, you always know where you are by the colour of the Page button. With no presets to beguine with (sorry) you’ll be glad that the process of programming beats is considerably easier than on the CR-78. It’s all fast and live too: you can leap freely between play and write modes without stopping, and no save process is necessary either — everything is saved as you go. Writing a pattern requires the age-old X0X method of enabling steps or, if you prefer, the Tap key can enter hits during playback, one instrument at a time. I found both methods to be equally fast and logical, boosted by a sophisticated copy-and-paste process. Unusually, you can consolidate up to four short patterns into a single longer one and copy them to new locations seamlessly during performance, if you time it right. To make your grooves less static, both drum machines introduce the idea of ‘nuances’ — automated shifts of the tone values. This involves the LFO I mentioned earlier, a per-voice concealed delight sporting four waveforms, variable depth and nine speeds that are synchronised to the current tempo. For its three ‘normal’ waveforms (sawtooth, triangle and square) the LFO cycle ranges from two whole notes up to an eighth of a note, while the final waveform, random, generates a random value for every hit. Incorporating nuances into your kits is a superb means of bringing them to life, whether by adding subtle random variations to the snare’s snap and bongo tuning or building a rising metallic content into the hi-hat. Continuing to add movement and variation, each step of any pattern can be given an accent, flam or roll — or all three attributes simultaneously. Dedicated buttons make the programming of these a doddle, with accented steps lighting in red, flams in green and rolls in blue. When in play mode, the same buttons introduce their charms non-destructively. Flam is adjustable from 6 to 60 ms, while Roll is a discrete note repeat — equivalent to adding a hit with 32nd-note timing, assuming a typical pattern of 16th resolution. On all models, the Time button selects one of the eight possible shuffle values and defines the pattern resolution, from the options of 16th, 32nd, eighth-note triplets or 16th-note triplets. There’s another way to generate repeated hits of the currently selected instrument. It’s a performance-based implementation requiring that you press and hold the Tap button. The speed of the repeats may be altered by keeping Tap depressed and turning the Tone control; the range is from quarter-note to an impressive 1/64th-note interval. At the fastest rate it delivers manic rolls you’d never expect from an elderly drum machine. The two drum machines have identical back panels, but each offers a different selection of direct outputs on 3.5mm sockets. Patterns are equipped with another groovy feature sadly absent from many modern drum machines — fills. These can be triggered manually or, in homage to the Roland CR-78, you can define an auto-fill interval. Having done that your fills will occur every 1, 2, 4, 8 or 16 bars, where a bar is considered to be a whole pass of a pattern, regardless of its length. The auto-fill settings aren’t memorised over a power cycle, but it’s quick to set them up and, best of all, there’s enough space allocated for every pattern to contain a fill. An ‘auto populate’ option instantly copies in existing pattern data. In play mode, pressing the Fill button fires it off once. In write mode, the fill remains active until disengaged, thus allowing you to work on it at your leisure. Right now there seems to be a bug in extending patterns that contain fills; the pattern extension works but the fill steps are wiped. Hopefully a fix will be issued in due course. If that were all, it would be a fun and deceptively powerful little drum machine, but it hasn’t given up all its charms yet. To help speed up operations, you can store up to 16 ‘clips’ for every instrument, where a clip is simply a favourite groove you wish to have permanently (and instantly) available. I didn’t immediately grasp the value of this until I started using it and saw how it could be a brilliant tool for juggling key parts of your pattern in a live situation — without affecting the other instruments. Several clip patterns have been created to get you started but it’s easy enough to wipe them and substitute your own. Another function laden with creative possibilities is ‘Mutate’. In Write mode this randomises the current instrument by throwing triggers around but doesn’t generate any new ones. In play mode it does the same thing to the whole pattern. In the Mix menu you can instantly mute and unmute a range of instruments, but there’s a less-obvious secondary function — that of playing each voice directly from the step buttons. Although you can’t record in this mode, you’re able contribute interludes of manual triggering for as long as the mood takes you. Finally, there are a couple of ways to chain patterns and therefore pass the 64-step limit. Most simply, in play mode you can select a range of up to 16 patterns to play in sequence. This is achieved by holding down a start and end point, whereupon the patterns are highlighted and the current one flashes. For more complex, stored structures, you’ll need Track mode. This offers nine Tracks — or songs — each of up to 240 bars (complete patterns). It’s also possible to effectively double the number of patterns you can call on, through cunning use of the Fill button. Setting up Tracks is as painless as I was starting to expect and, once set up, you can still manually select a range of patterns to loop. The whole thing is pretty slick, the only drawback being the inability to switch in and out of Track mode without stopping. For ease of identification, patterns keep their original colour so you can identify them in a long chain. The Roland TR-606 was often regarded as the poor relation to the larger, more pro-looking TR-808, but it buddied up nicely with the TB-303 and its snare was, arguably, superior to the 808’s. Snare preferences aside, it was great to revisit the sounds for a reminder of Roland’s uncanny ability to create excellent percussion voices. The Drum Drone is fitted with a different set of instruments to the TT-78, but otherwise it works in exactly the same way — the two even share a manual. With only nine voices this time, there’s less need to share knobs and outputs. Here, the cymbal and hi-hats can be processed separately, and there’s an open hi-hat too, something absent from the TT-78 (although its cymbal makes a passable stand-in). Once again, the Tone control is employed to add voice-specific variations. For the bass drum, it sweeps the tuning rather than the decay. The drum also gains a marked initial click when accented, and slightly raised pitch. The snare is a near match for an original Drumatix and its body component is noticeably louder than the snare found in the TT-78. As you turn the Tone knob clockwise to increase the noise level, it’s also subtly filtered. Lacking the Latin flavours of the TT-78, the TT-606 is more about standard drum sounds. Instead of bongos, you get toms and these are as dull and thuddy as those of the original Drumatix. Much better are the hi-hats — in both closed and open incarnations. For extra variety, there are six different voicings available. The open hi-hat’s decay is variable while the closed hat’s tuning affects both. Equally valuable are the four zingy cymbal choices, with the timbre selection stored, as always, in one of 32 user kits. The cymbal is notable for having a second tone parameter; by holding Func and turning the knob, you can shift its tuning. The rimshot veers between a short blip and something wonkily close to a cowbell. It was never the most useful of instruments, but it could still be of value, with its audio output a good candidate as a trigger. Last but definitely not least, the clap is top notch, especially at its shortest, snappiest setting. Playing and programming is entirely consistent with the TT-78. This means you can apply nuances, flams and rolls, use fills and structure patterns in Track Mode, and do all the other good stuff. Which of the two you prefer may ultimately boil down to preferences of clap over claves, toms over bongos and similar choices. Bringing up the rear is the TT-303, the oldest member of the family. The original version was eerily close to an exact replica, but since changes have been made, I thought it a pity to still find the tuning knob so close to the cutoff frequency. Sometimes authenticity is not the best approach. The tuning has a wide range too — approximately eight or nine semitones either way. 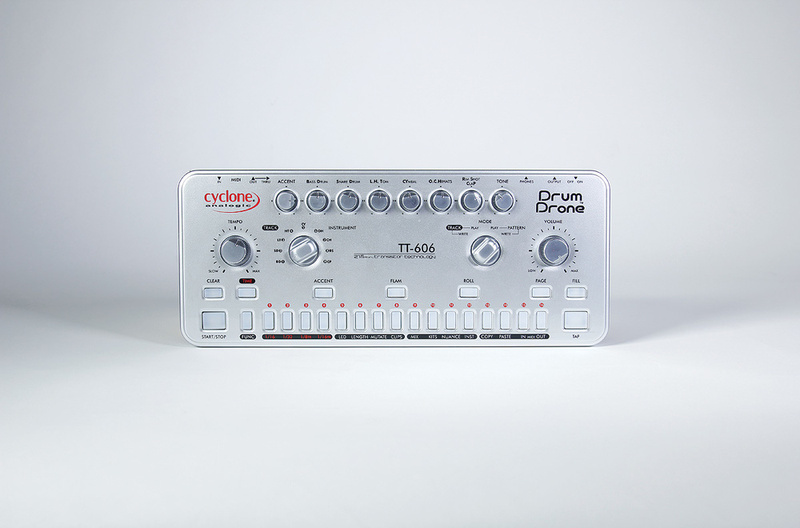 Much has been written, spoken, theorised and, frankly, gibbered about the magic of the TB-303, but as years have passed, clones in hardware (and software) have edged ever nearer. With significant variations between genuine Roland Basslines anyway, anyone daring to make absolute comparisons is on shaky ground — even before the effects of age and use are factored in. To my ears, the Bass Bot sounds and reacts like a TB-303 should. I may have mentioned this before but, back in the ’80s, I used a pair of original Basslines extensively, not for their sound but as sequencers. It was only years later that I grew to appreciate what else they had to offer, but by then I’d given mine away. Belatedly, I warmed to the wet and tuneful resonance, the hollow, floor-shaking oddness of the square wave, the deep rasp of the sawtooth, all present here and completely believable. Which is entirely as you’d expect from what is, essentially, a modern surface-mount rebuild. Perhaps some of the controls go a little further than machines of old, for example it sounds as if the accent and envelope depth go to 11. But on the whole the Bass Bot is a stunning recreation. Who knows, maybe in a few decades we’ll be discussing how well it has aged and changed? Cyclone Analogic should be applauded for introducing a number of extra features to extend the tonality of the limited 303 palette. Of these, mute is a means of cutting selected notes short, a similar idea to dampening the strings of a bass guitar. Hammer is also inspired by bass guitar technique, in this case its effect is to extend a note into the next. Sprinkling mutes and hammers across your patterns and combining them with slides and accents may yet breathe new life into this acidic little box. But what, you ask, is it like to program? In contrast to the two drum machines, there are almost too many competing ways to make patterns. Sadly, many cannot be used without interrupting play. Of the nine possible Mode selections, six relate to pattern playback and creation, but fortunately there’s no need to master them all right away. There’s a ridiculously large pool of patterns, consisting of 108 presets, 432 user patterns and 108 ‘Lab’ patterns. Each mode has its own speciality and learning curve and apparently the presets differ from machine to machine. Impressively, even they aren’t fixed and unalterable: presets simply require a different method of creation than the regular step-editing process. Specifically, you generate preset variations using the Gen function. This isn’t quite so random as it first appears — a different flavour is generated according to which of the nine pattern banks you happen to be in when the function is invoked. For an alternate means of jiggling existing pattern data, I became quite partial to Mut, or mutate. This produces more subtle variations which maintain the current pitches, but throw the rhythm around instead. You can, at least, switch between Preset and Play mode without stopping, but once you go further around the dial, the music stops. Navigate to Write mode and there are several write techniques to audition. In the most obvious and intuitive, you repeatedly press the Tap key and use the small keyboard and associated buttons to set the values for each step. The other alternative — which requires some notes to be present already — is to hit Run, then hit the Clear button. At this point a metronome will start and you use the Tap key to impose the new timing. At any point you can further tweak your patterns by transposing them, colouring them and shifting their events from left to right. Loop Edit offers a different slant on pattern creation and it operates effectively in real time. As such, I couldn’t help thinking it would have worked better if adjacent to Play mode on the dial. As it is, to reach it requires turning a couple of notches, which inevitably stops the music. In Loop Edit, you enter notes along with accents, octave shifts, etc, as the pattern loops around, making adjustments as you go. Navigate to the Pattern Lab and you find an extension of the Gen (generate) function mentioned earlier. Its main advantage is allowing you to dig in and fine-tune the characteristics your patterns will receive, even down to specifying the notes and modifiers you’d like included. Each of the nine personalities can have up to 12 patterns associated with them — and any that sound good can be freely copied into the user area. With a wealth of methods for editing patterns, it’s a relief there’s also an Undo. This covers clear operations, actions in Loop Edit, generating or mutating a pattern and several others besides. In a single operation you can discard potentially drastic, sometimes ugly changes. Unexpectedly, an arpeggiator found its way in too — but not a regular arpeggiator. This one takes user patterns as its starting point, applying their rhythms, note lengths and other attributes to notes entered on the mini keyboard. Four arpeggiator directions — up, down, up/down and random — turn existing patterns into something new and hopefully fresh. Again, if you like what you hear, the results can be copied permanently into the user pattern area. I was initially sceptical but found this to be ideal for changing the key of a pattern or laying key changes over several patterns. 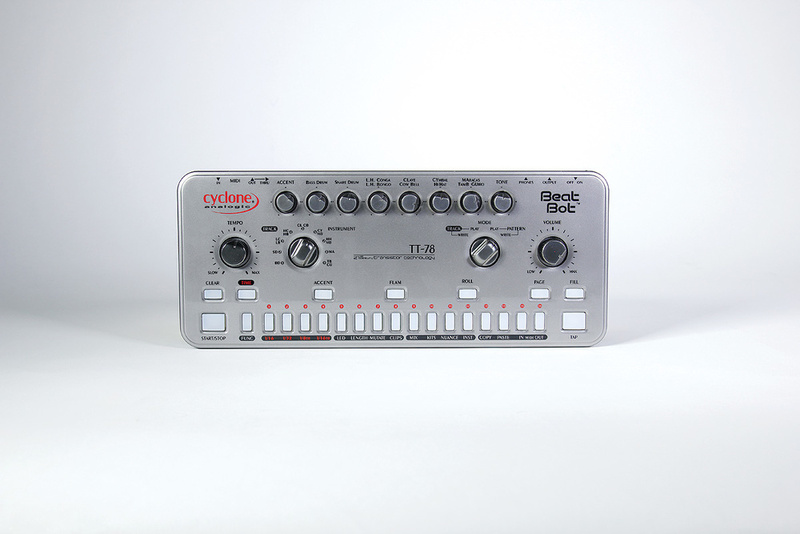 Unlike a real TB-303, you’re given global control over the gate length and slide time. And in performance, non-destructive modifications such as adding accents, slides, hammer, mute and transposition can all be applied liberally. There’s so much packed in that I suspect the TT-303 is going to be used slightly differently by everyone. Happily, it shares the two drum machines’ live pattern chaining and Track Mode method of creating longer structures. Round the back of the TT-303 we find, in addition to the quarter-inch headphone and outputs and MIDI I/O ports shared by all three machines, a selection of CV and Gate inputs and outputs as well as the crucial waveform selector switch. Before arriving at any conclusions, those rear jacks are worth a once-over. The oscillator output is just what you’d imagine — a pre-filter saw or square wave. Next, any connection made at the filter input replaces the internal waveform. If you plan to process external signals, it’s handy that a permanent note-on event can be simulated using Filter Hold. You therefore needn’t have the sequencer running to hear the effects of the filter. Other than that, the clock and CV/Gate outputs (1V/oct) are self-explanatory, and the dedicated accent out is a real bonus for injecting acidic blips into external modules. Although the CR-78 and TR-606 aren’t as sought-after as the more famous TR-808 and TR-909, their sounds continue to be desirable, maybe because they can be slipped effortlessly into practically any context. I’ve long regretted parting with my CR-78 and the TT-78 is the closest replacement I’ve heard — and a better choice in so many ways, not least because of its programmability and user kits. With eBay prices still on the ‘beggars belief’ side of reasonable, brand-new alternatives with multiple outputs, many patterns and slick extras have to be a good thing — for music-making if not necessarily for hoarding. That said, the newcomers aren’t ultra-cheap, especially if you’re tempted by more than one. As to which is top of the Bots? The TT-78 takes some beating for sheer variety, its Latin percussion suggesting way more versatility than plain vanilla drum boxes. However, it’s not so straightforward. The TT-606 contains some clearly superior instruments, eg. the sweet hi-hats, snare and clap, which edge further ahead when external treatment is applied. Both Bots include solid kicks, one with a variable decay, the other variable tuning. Perhaps the TT-78 wins that particular contest because its bass drum has a little more body, but it’s a close call. In the end, there are reasons to justify owning both, if these particular sounds excite you and your budget stretches to it. The TT-303 chirps, wows and blips as it should and is kitted out with tons of patch storage and more I/O than expected. Its sequencer has been piled high with so many choices that at least one should feel right. Personally I’d rather have had a single method of programming that was fast, direct and not reliant on stopping — like the two drum machines, actually. Still, of the options provided, Loop Edit mode, with a little collaboration from the mutate and generate functions, did the job beautifully. Your mileage may vary. Colour is used to great effect across the range. The trouble is, all my gear with red, never-changing LEDs now seems really boring and uninformative in comparison. It’s just one of many examples of the thought that has gone into bringing these old circuits into the 21st Century. Whether they represent the last word remains to be seen, but they deserve to do well. For the TT-303 there are numerous alternatives, including the AcidLab Bassline and Adafruit X0Xbox. 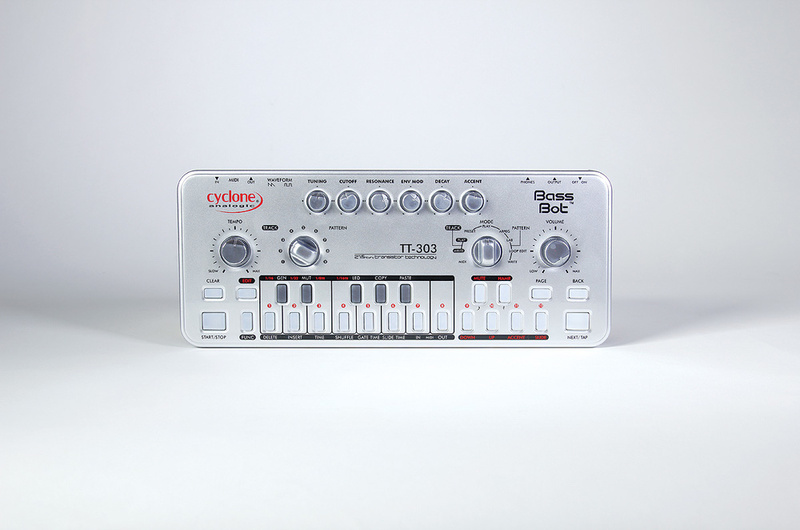 Roland themselves now have a boutique model, the TB-03. While its internals are pure software, it certainly looks the part and includes cool morsels such as built-in delay. There’s no boutique TR-606, but the Drumatix voices were added to the 7x7 expansion for the TR-8 machine. If you insist on analogue then Acidlab’s Drumatix is worth a look. CR-78 clones, however, are thin on the ground. Ultimately, the Arturia Drumbrute is the elephant in the room these days when it comes to affordable analogue. At first glance, you might think the two TTs would struggle to compete with it, yet they’re different enough, not least because Arturia went their own way with many of the voices while the Cyclone Analogic boxes have stuck as closely as possible to the Roland sound. Perhaps the greatest surprise of these shiny little boxes was the extent of the MIDI implementation, the drum machines in particular. For every instrument of the TT-78 and TT-606, you have MIDI CC access to the tone, nuance shape and amount, and mutes. Even parameters such as the flam time, shuffle amount and auto-fill interval are MIDI-controllable. The TT-303 isn’t quite so well-endowed. You don’t get MIDI access to the knobs, but you can select 48 of its patterns via notes, or trigger its voice remotely, adding accents and mutes by varying incoming velocity. All models support SysEx backup and restore of their pattern and track data. The drum machines’ classic voices are given extra control, user kits, individual outputs and much more. The Bass Bot is a shiny new Bassline with tasty additions to its sonic capabilities and a host of ways to generate patterns. All three boast a superb use of colour, generous patch storage, MIDI and plenty of live performance features. It would have been awesome to have just one consolidated drum machine. The selection of many of the Bass Bot’s modes stops the music. Although these don’t have Roland written on the panel, they are portable, fab-sounding instruments and credible sound-alikes for the TR-606, CR-78 and TB-303. For extra appeal, they have MIDI, plenty of patch storage, live performance features and glorious colour throughout.